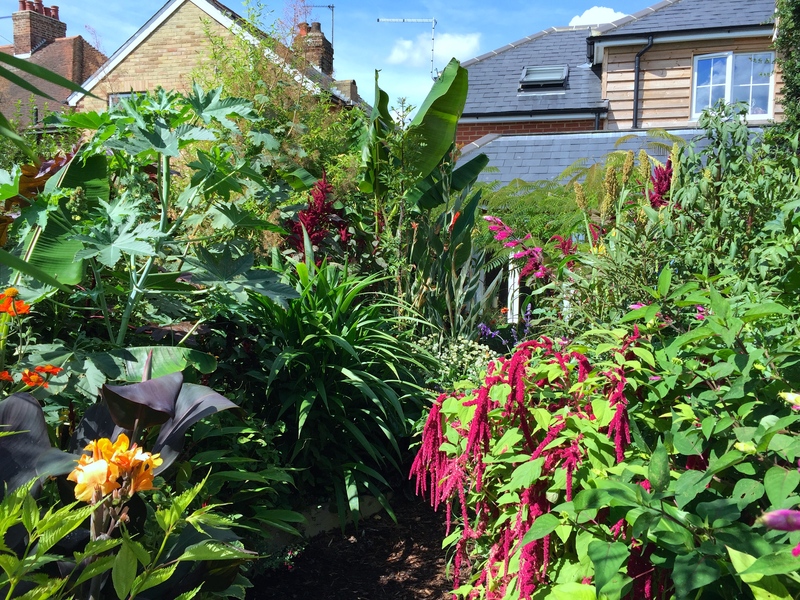 When a new garden opens for the National Garden Scheme it&apos;s always exciting, but when that garden has been created by two professional gardeners with a passion for rare and exotic plants it&apos;s certain to thrill. As soon as Steve Edney and his partner Louise Dowle begin to talk, their infectious enthusiasm spreads to all who will listen. Steve&apos;s experience as Head Gardener at The Salutation and Louise&apos;s gardening work for private clients brings the pair into contact with thousands of unusual plants. They have a story to tell about each and every one, but those they have chosen for their own plot are selected for the beauty of their foliage first and foremost. 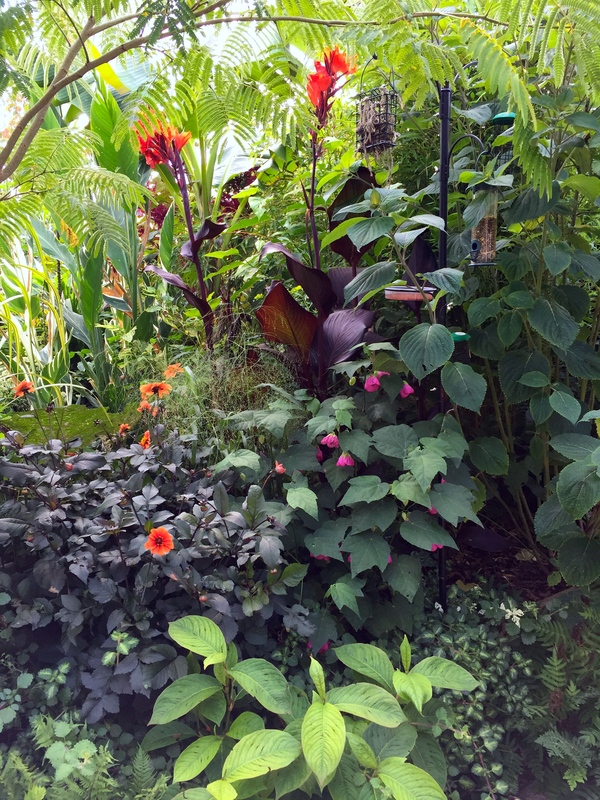 Plectranthus and persicaria are a particular obsession, with Steve&apos;s dahlia addiction evident everywhere he goes. 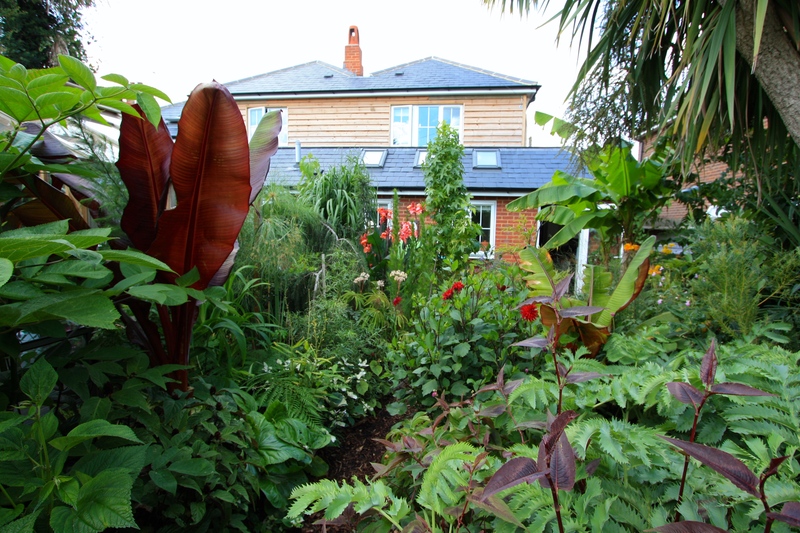 The handsome house and garden at Sweetbriar have been created by Steve and Louise in the space of four years. The property has been transformed from a two-up, two-down dwelling into a smart, ochre-coloured cottage on the outskirts of the pretty village of Ash in East Kent. 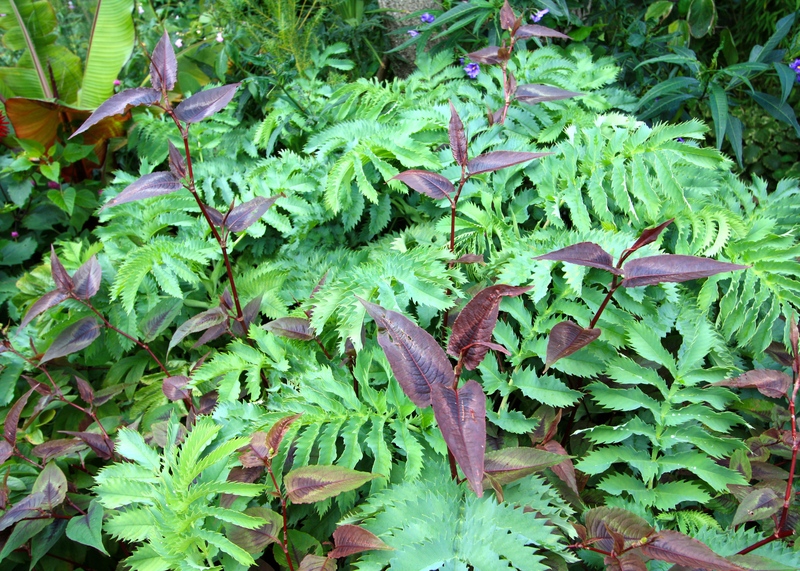 The back garden, once laid to lawn with only conifers, a cherry tree and a gargantuan cordyline (the most impressive I&apos;ve seen), is now a tropical paradise packed with extensive collections of canna, amaranthus, plectranthus, persicaria, miscanthus, coleus, salvia and all manner of exuberant exotica. 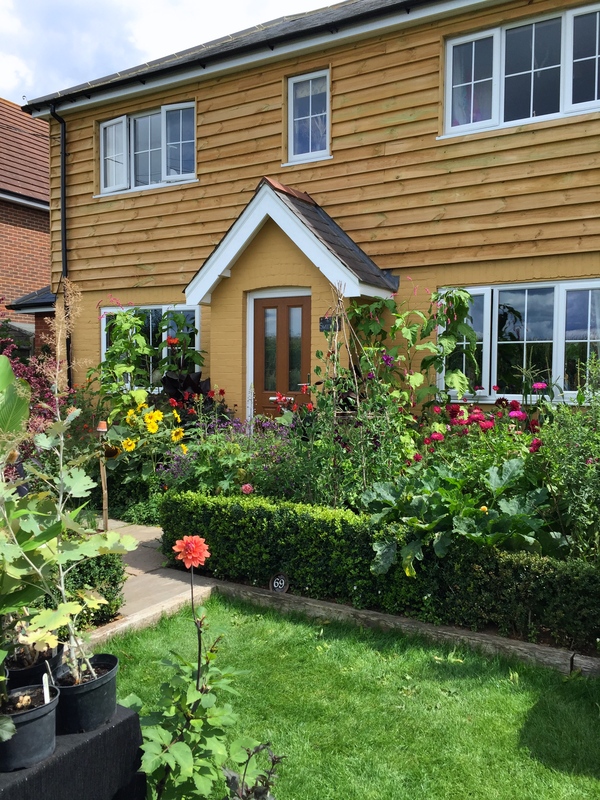 The front garden has been laid out as a traditional potager, the box hedges neatly filled with vegetables and flowers. Along the boundary fence, apples and pears are grown as oblique cordons, each one bearing a heavy crop. 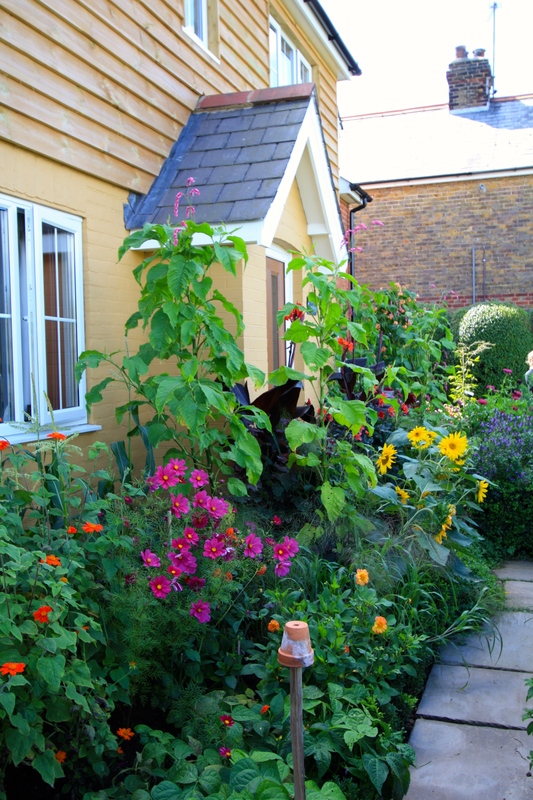 Near the front door generous clumps of cosmos, zinnia, helianthus and tithonia frame the front door, guarded on either side by towering Polygonum orientale (brilliantly dubbed kiss-me-over-the-garden-gate) and pots filled with Dahlia &apos;Waltzing Matilda&apos;, one of my favourites. What stood out for me is that every variety was planted in a big enough group to avoid looking too wild and wanton. Sweet corn planted immediately beneath one window cleverly referenced the crops growing in the sun-baked, fertile fields around and about. As we entered the back garden, along an unassuming concrete path bordered by privet, we were cautioned not to stumble into one of two rectangular pools sunk into the paved terrace. These water features create the most attractive of hazards and I confess to a degree of disappointment that I did not witness anyone plunge in. Even a near miss would have been amusing, but it was not to be. 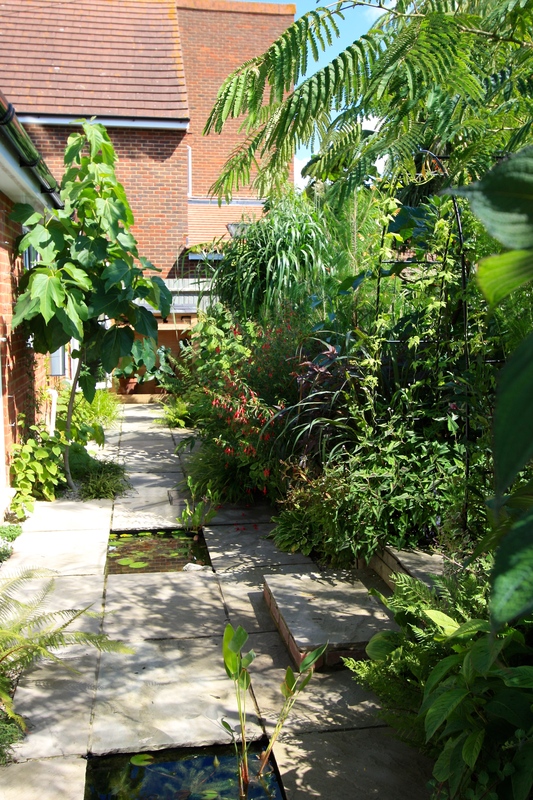 This narrow strip of garden, from which paths lead into thickets of luxuriant planting, was a haven for ferns and other small foliage plants which might have been swamped elsewhere. At the end of the long vista was a wood store, doubling as shelter for a handsome pair of colocasias. Against the wall, climbers such as Cobaea scandens had begun to disguise the red brick and may have concealed it completely by the first frosts. I was accompanied by Stephanie, the mother of one my best friends and a local Broadstairs girl. She disappeared into the undergrowth like one of Rousseau&apos;s tigers before I could say &apos;Tenko&apos;, oohing and ahhing at the multitudinous textures and colours she had discovered within. One path led to a large timber greenhouse, situated just a few feet from the back of the house and yet it was almost hidden by fountains of miscanthus and drooping veils of pine. Steve and Louise are not afraid of heights, in the planting sense at least, and are brave enough to bring tall specimens right up to the back door. When you think about it, this makes complete sense as height provides privacy and shade in summer, as well as enhancing the expectation of what might lay beyond. The greenhouse required no ugly whitening as it was enveloped by cool foliage on all four sides. Within the warm confines of the cedar structure I found the extraordinary Solanum quitoense, a plant with vast, emerald-green leaves covered in purple hairs and vicious spines. 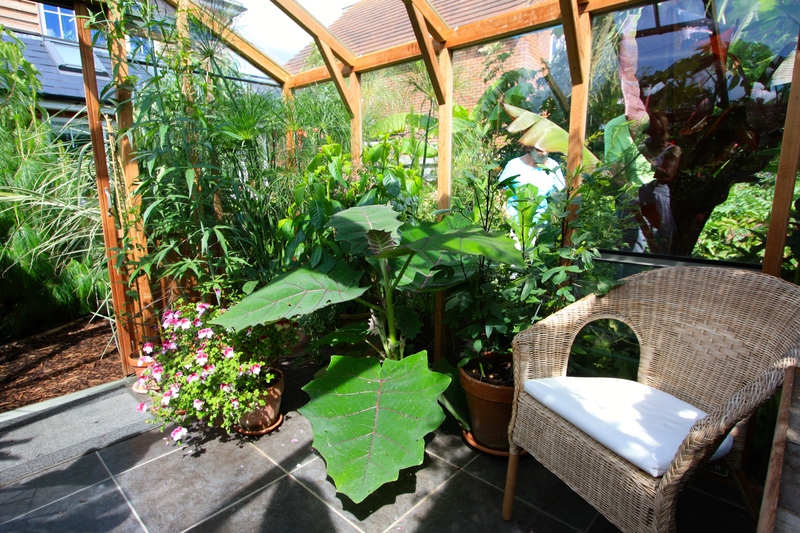 The naranjilla (&apos;little orange&apos;), as it&apos;s known in Ecuador, needs a sheltered, shady position to grow well. It produces fruit which are described as tasting like a combination of rhubarb and lime. An unusual flavour pairing, but then there&apos;s nothing usual about this garden. Steve and Louise are also making a collection of pseudopanax, a curious family of shrubs and trees with tough, evergreen leaves. A few acquisitions, such as Pseudopanax ferox, the toothed lancewood, could be found languishing here. Not far from the greenhouse was the feathery form of Eupatorium capillifolium (dog fennel), a plant I have so often admired at The Salutation where it grows to an impressive size. 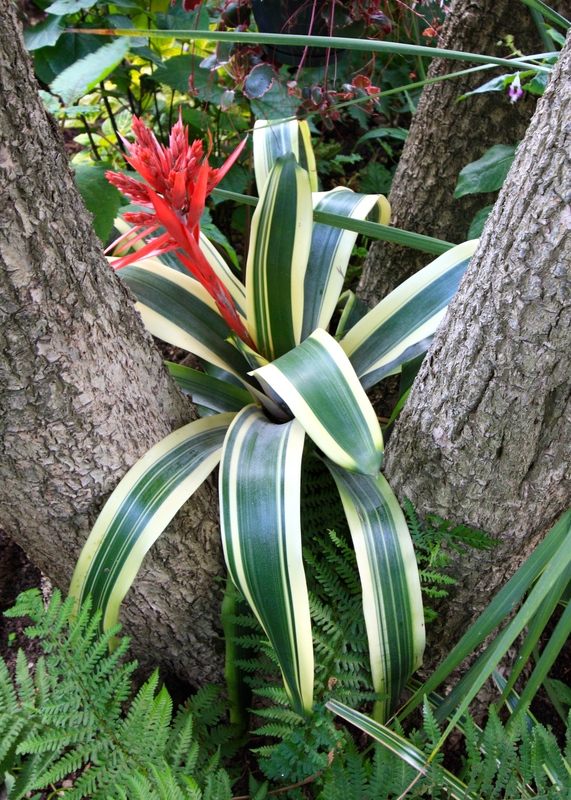 Its delicate form, like a Roman candle exploding from the ground, provided a contrast to the tough, old cordyline, so big and dense that it was able to support a small community of bromeliads, each nestled comfortably where the trunk had forked. Little touches such as this add a real sense of other-worldliness to this garden. 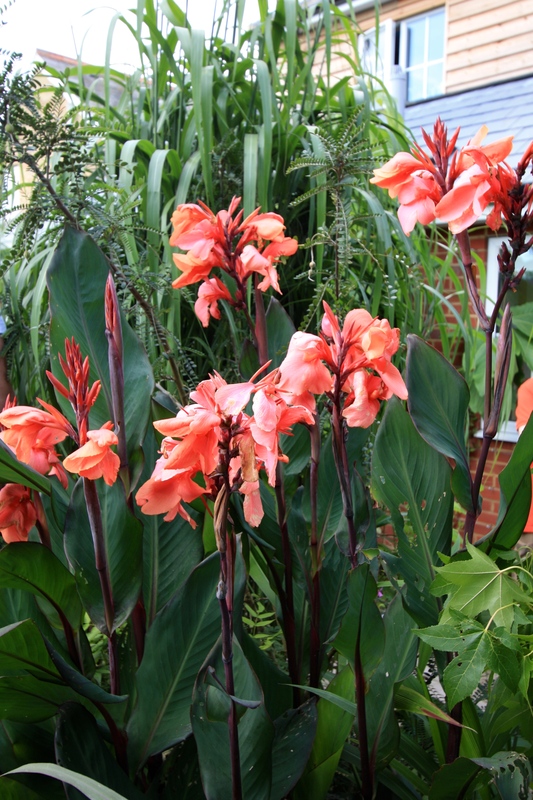 Definitely out-of-this-world was a spectacular clump of Canna x ehemannii, which made my little scrap of a plant cowering in the corner of the greenhouse seem rather pathetic. Proof, if any were needed, that it&apos;s rarely better to grow a plant in a pot, rather than in the ground. Here one could walk right underneath and look up at the pendant, pink flowers against a clear blue sky. I shall be transferring my canna into the largest pot I can find in the hopes that it might forgive me for imprisoning it. As in my own garden, several plants had been severely damaged by capsid bugs, insects which cause unsightly holes and distortions in leaves thanks to the toxic saliva they inject when sucking sap from tender new growth. Steve and Louise employ organic methods when tending their garden and so accept that occasional attacks will happen. Thankfully the foliage in the garden is so diverse that one might easily mistake damaged leaves for a desirable new form. Added to which it&apos;s nice to know that even the professionals&apos; gardens are not immune to pests and diseases. At The Watch House I try to pack in as many plants as I possibly can, but I was staggered by the tiered layers of foliage and flower that Steve and Louise had engineered both horizontally and vertically. Some of the beds were very deep – more like jungly islands – and from one&apos;s feet to way above one&apos;s head there was something intriguing to look at. I had to walk around at least three times to have any hope of taking it all in. At the back of the garden there is an extensive deck, a very smart garden hideaway and a hot tub. It was here that teas were being served and very excellent they were too. My cherry and almond slice was delicious and much-needed as I had skipped breakfast, which I am guilty of doing most weekends. Alas visitors were not invited to strip down to their briefs and take a dip – if they had been, they would have been hidden from view by more exuberant planting. 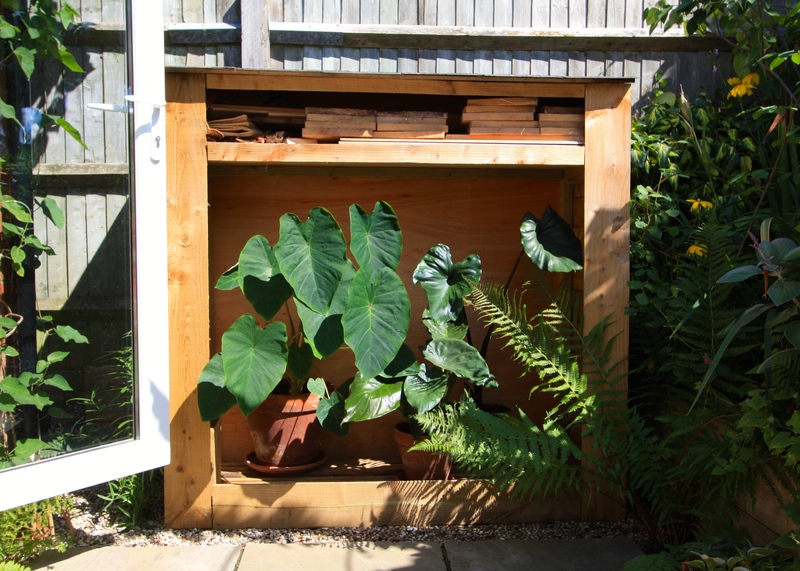 Louise confided that she had rooted cuttings and germinated seeds by placing pots and trays in under-bed storage boxes ontop of the hot tub&apos;s cover. One swanky propagator! The path leading back towards to house passes a lovely group of shrubs underplanted with Begonia &apos;Dragon Wings&apos; and Lysimachia nummularia &apos;Aurea&apos; (golden creeping Jenny). A brave association but it worked perfectly here. 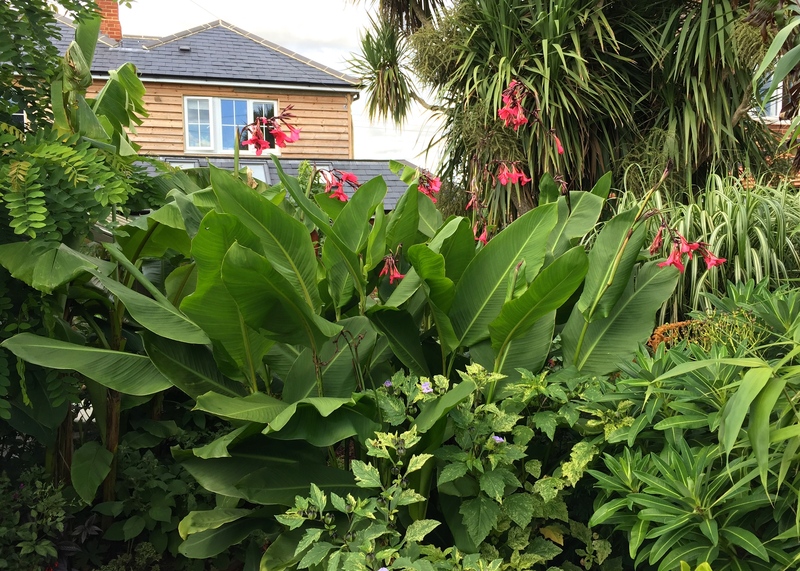 We wended our way through colourful thickets of Salvia involucrata &apos;Bethellii&apos;, just coming into flower, more cannas, stands of sorghum (Sorghum bicolor), luxuriant amaranthus (love-lies-bleeding) and a stunning ricinus (castor oil plant) with silver leaves. By the time I arrived home I had already given myself a stiff &apos;must try harder&apos; lecture and immediately set about rearranging and reappraising my own planting. 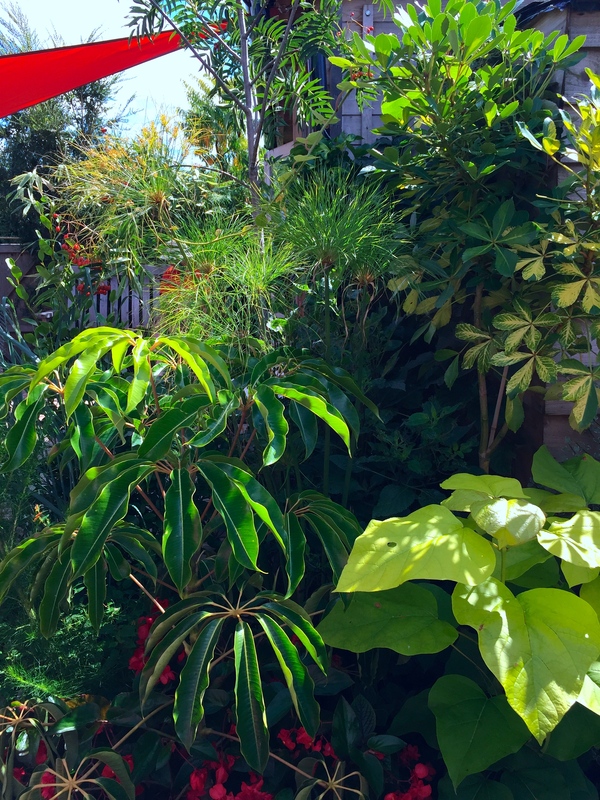 Steve and Louise&apos;s garden demonstrated to me that there are plants with a tropical appearance that will grow happily in those tricky, shaded spots, and reaffirmed my view that bold scale and height are absolutely acceptable in a small space. In fact, I identified several spots where I think I could go higher next year using grasses, bananas, cannas or trees that can be pollarded, such as catalpa and paulownia. My biggest issue as the original trees mature is that my raised beds are becoming very dry, even with regular applications of organic matter. I may, reluctantly, have to resort to an irrigation system next year. Talented gardeners both, Steve and Louise definitely understand the jungle formula. At Sweetbriar visitors will find a garden that appears mature and diverse after only four years. What heights it can achieve in another four, eight or twelve years one can only imagine: it&apos;s paradise in the making. 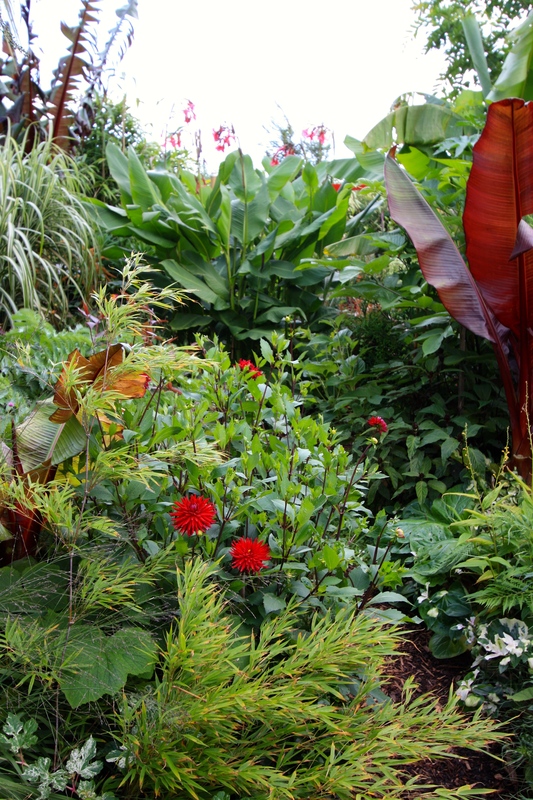 As a nation we are fortunate that such a great many garden owners are prepared to let the public into their private domains to be inspired, stimulated and excited to garden better, discover new plants and just &apos;be&apos; in a unique and personal environment. With luck there will be more gardens open in our part of Kent next year, demonstrating what a fantastic climate we have for growing, in particular plants that appreciate warmth, good drainage and long hours of sunshine. Sweetbriar is open again for the National Garden Scheme on Sunday 10th September and Sunday 8th October, 11am – 5pm. Admission is £3.00 and children are admitted free of charge. I should like to visit again in October to see just how large those bananas and cannas have become. I&apos;ll take a map and compass just in case I get lost in the undergrowth. Thank you Dan! I had so many plants whose names I needed to know but Steve and Louise were very much in demand for the same reason so you have just helped me add to my list of MUST HAVE plants. I too was in awe of the amount of plants growing there and just wanted to lift the whole garden and drive it back to my home! 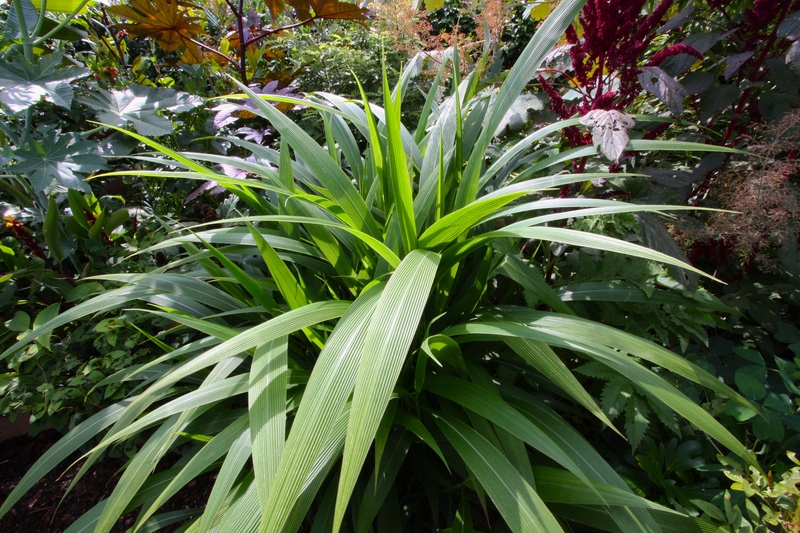 I would love to get my hands on a pot of the lovely red sugar cane – there was a huge clump in the garden and I bet it’s tricky to get hold of in UK. How did I miss that then? I could not see for looking!! TOO MANY super plants and, like you, many I was not familiar with. I do not enjoy such an open aspect as Steve and Louise, but surprisingly I do very well with agapanthus that like a lot of sun. I am looking forward to going back later in the year to see how everything has developed. In the meantime, I’m going to set about my own garden with renewed vigour! First of all thanks for this article. Your description and photos are a delight. Here in New Zealand in the North Island we can grow most of the plants shown, but to have them in such a confined area was breathtaking. Keep up the wonderful articles and your plant knowledge is so welcomed. Thanks again Dan. I’ll take perfect, thank you Barbara! 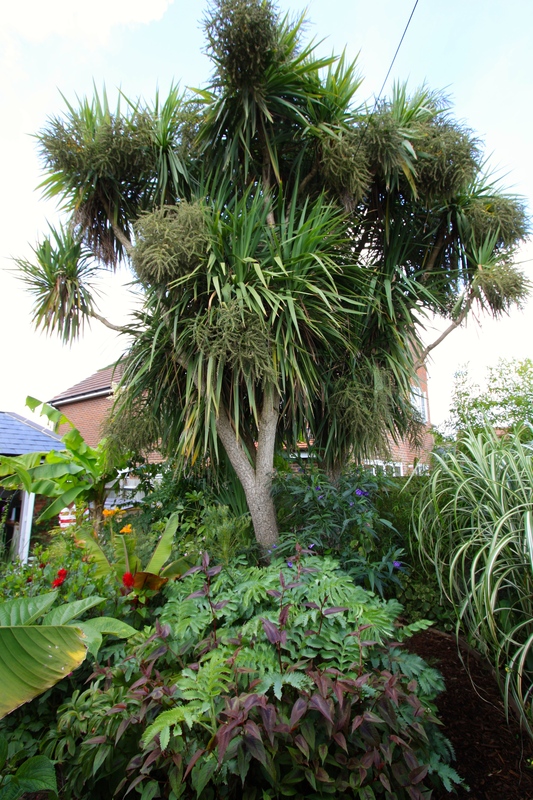 I am considering whether I could cultivate some air plants, including Spanish moss, in my Lyonothamnus …. hoping I am not taking the inspiration too far! A joy to read and the photos are so well taken that I felt I was in the garden, thanks for an excellent garden review. I will try to get there this autumn on one of the open days. I agree, palm print shirts are much more acceptable! Thanks so much Dan for such a kind review! Not sure it’s all deserved. But we do garden purely for our own pleasure at home, so you’ll never find something we don’t like there. Also great pics, you’d be welcome to come back sometime to take more pics and have a cup of tea when we are not open. That would be lovely Steve, I will take you up on that offer. I was not entirely happy with my photos as I know I could have done your garden more justice had I had more time to think about it. I hate it when someone is taking snaps when I am trying to have a good look, and so try to keep out of the way. However all praise very much justified. People don’t appreciate how much thought and effort goes into opening a garden …. although I know you do …. with bells on. thanks so much Dan for this. As others have said. I felt as if I was in the garden visit with you. Gosh how envious was I. Up here in Cheshire although I am on lovely sandy loam and many things you wouldn’t think would do come through the winter, our summers are just not sunny nor hot enough to enable such exotica to thrive, sadly. Never mind Kathryn. Grown what you can well and enjoy those plants instead. Where we are we are blessed with unusually high sunshine levels and quite a warm microclimate, which really helps make the exotica feel at home. the setaria and mature miscanthus (cabaret?) were nice too. 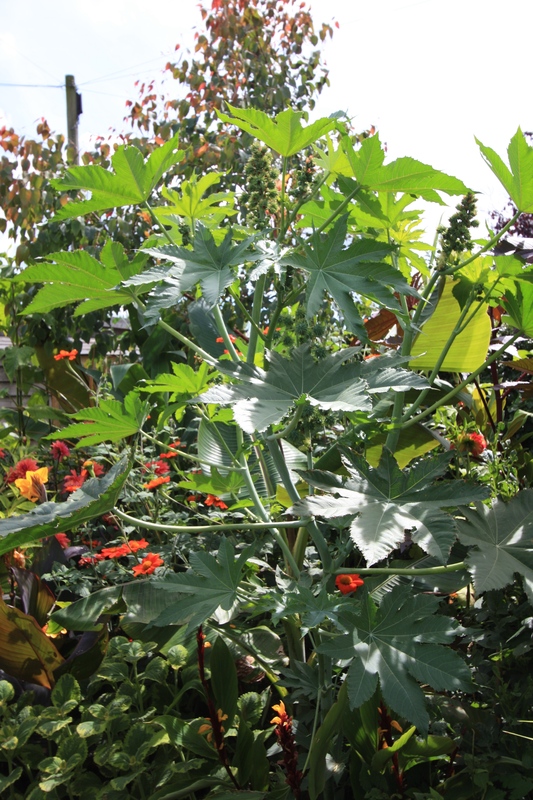 I liked the plant in the pot, also on the back right hand side of the garden, that was about 2 meters tall with big blue cabbagey leaves, i dont know what it was but it looked very tender. I agree, £3 can’t even buy a pint of beer these days, and I’d need several to have as much fun as I had at Sweetbriar 🙂 There are lots of plants I’d like to go back and look at closely again, but I did clock the bamboo and the mysterious blue giant tucked away near the barbecue. No idea what that was, so I must ask. If I find out, I’ll let you know. I think its a nightshade – solanum quitoense. Seeds available from Chiltern Seeds. Oops, no I am talking about the wrong plant…..just referred to my notes and I too had a question mark about the large blue giants name….would love to find out! One of us should ask really! I will drop Steve a line. I visited Lou & Steve’s garden yesterday and was blown away by it. Such fantastic colours & textures and I came away (with 2 cannas) also thinking I should do much better. My problem isn’t space to plant in but living in a dip which is a frost pocket. I have a poly tunnel and a greenhouse but these are so stuffed full of succulents that nothing else gets a look-in. Perhaps a new one just for exotics…. Yes! Go for it Fiona. However exotics do grow a lot faster and bigger than exotics so be warned. You’ll soon be wanting another, and another! Hi Dan, thanks for the fantastic photos – I’m curious what the small feathery pinnate(?) – almost mimosa-like – tree was, the one nearest the entrance to the back garden. It’s beautiful. I think you’ll find it’s Albizia julibrissin, the silk tree from China. Lovely tree, but needs a sheltered position.